Dear sir I have my name in voter I’d list but I have not voter I’d card for proof . So plz suggests me .how I can receive my card. I am belong from dehradun. I was apply for it on December 20017. I have lost my voter id card. Pkease let me know the process. In Pune Where to submit Form 02 of lost voter ID card form ? I have a valid voter card. I have just shifted to another house. How do I get the address details changed in the voter card? I LOST MY VOTER ID CARD. CARD NO -UYU0578039. PLEASE IF POSSIBLE RE-ISSUE THE SAME. 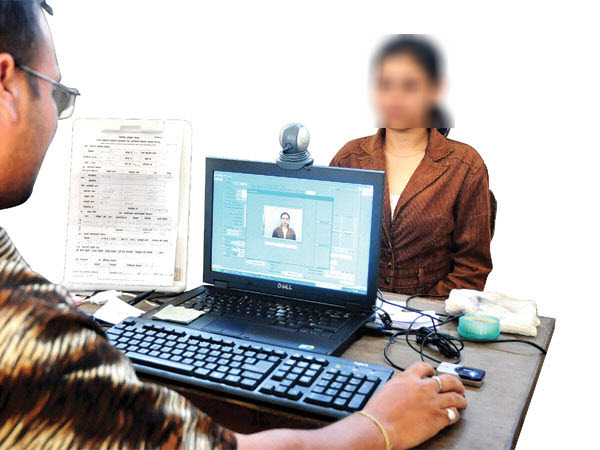 I HAVE LOSS MY ELECTION VOTER ID, CAN I SEE THE IMAGE OF MY VOTER ID ON NET AND DOWNLOAD. My origional voter card no jqz6902456 has been lost.So pl issue Duplicate Voter Id Card . which procedure for reissue the election card ? even i have’t id no. too of my last election card.. I applied voter ID online I received VoterID card Nos and the names are included in the voters list but we have not received the VoterID cards. i lost my id. Please give me duplicate voter id. I lost my voter ID number :UZG0414664.So kindly request to you that reissue a new voter ID card and send to same e-mail ID or same address mentioned. Greeting of the DAY and HAppy Holi in advance. I have a request related to my Ellection ID card. My election card was issued years back in 1995 which carries the old photograph and address given at that time. Now how do i get a new election card reissued. Can we have the address and telephone numbers of the issuing officer / office where the same can be done. can you please gaid me. I have submitted the form 6 to the local election office yesterday (9th March 2014). Can you please tell me by which date my name will be enlisted in the voter list and I will get my voter I card? i lost my voter id card .my election number is CKW5296199. please provide my voter id card on my email. My Complen no. UP/9/71/215381 MY VOTER ID CARD MISS SO PLEASE ISSUE ME A NEW VOTER ID CARD . I lost my voter identity card and I applied three times though my B>L>O> but till date I could not get the same. I also approached to the local office but in vain. we come under Varanasi Cantt constituency. I have available Xerox copy of my ID card. sir i live in kanpur shyam nagar-208013 . my name is already submit in voter list. but i have not recieved my voter id card. i am try many time with form fill up but my id card noy recieved me. pls help me. i lost my voter id card .my election number is wmu1447042. my aunt who is 77 years has lost her voter’s I.D. We are not having copy of the voters card. How can we get the card. Pl reply. I have registered myself on 26/july/2013 but still not get my and my wife’s voter card. I Monesh Prakash kadam I am make a voting voting I didn’t get the voting card how I got the voting card what is the process; because i fill the form -6 . I have voter ID, Mumbai (Maharashtra) address, have permanently shifted to native place Mangalore, South Kanara, Karnataka – how to make changes/get new voter ID please? In my parents voter cards , address is printed wrongly , i have applied for corrections and till now there is no updatation. Sir I have loss my VIDC in odisha Angul Dist. so, how I get duplicate VIDC? I have lost my Elrction voter ID & PAN CARD IN METRO AT RAJIV CHOUK some one pick pocketed. Regarding this fir has neen lodged at Kashmiri gate police station.Election ID No:SJE1303148, and my PAN CARD NO”AKRPK7950L. Please ome body can help me to get duplicate copy of above document. My voter id no is HZT1145457. Please check my voter status. I have change my address in the same state but deference assembly area. so how can i enroll in that area. if we do not have any residence proof in the new area. My origional voter card no SYJ0450429 has been lost.So pl issue Duplicate Voter Id Card . Iam pavan kumar.I lost my voter id, i have voter id no.but i dont know how to get original id.Please help me&suggest. i have been alsomy voter i.d. no.itv0956532.some my problem is my husband name is wrongly printed. so please correct my husband name is as sanjay kumar sinha. my electoralregistration officer for125-bareilly cantt. sum my problem is surname & age loss my V I. card so kindly please request to you correct my V I. card. my correct name & age given billow. i have aiso registration.but,not recieved e-card. pls reply to me…What can i do??? moh-barah-patther, ward-36, town-deheri-on-sone, dist-rohtas, bihar pin-821307 please if possible re issue the same. H.No.116 , Vill.-Molanapur,Dist.-Jaunpur Pin-222165 For-259-Machhaleeshahar,Place : Jaunpur.Date:19.12.2001, please if possible re issue the same. i have been loss my voter ID no is FTJ 1274224 please if possible re issue the same. i have been loss my voter id please if possible re issue the same. i have been loss my voter id no is KML1176106 please if possible re issue the same. Applied on 06-11-12 for change of address (WB/20/139/141367) and change of date of birth plus address in respect of the EPIC No WB/20/139/141368. No change reported so far. My ID NO IS IXR1462647 NOT RECIEVED THE ID CARD. You are requested to go to the local or nearest election office and/or your area Both Level Officer (BLO). i have been loss my voter id no is Y1S0108720 please if possible re issue the same. I have lost my ICard, pick pocketed and I have made a GD. I live in Kolkata-700073, Bowbazar P.S. I don’t have a copy of the ID. What to do? all residing at 25 B, SURYA APARTMENTS, SECTOR-13,ROHINI, DELHI-110085.However, voter I.card of only my son at S.No.3 has been received. When I checked the latest voters list I find that my tenants premkumar,jyoti and their servant who vacated in January 2011 and no longer stay in my house are still figuring in the voters list with the above address astheir residence. This is highly irregular.I request you to kindly delete their names and issue voter I.cards for me and my wife whose names are at S.No. 1 and to above.